“This is a great moment. I will work tirelessly for bringing a positive change in lives of the poor. I will be an honest officer with a difference as the god has given me a chance to serve the people. I will do it with utmost sincerity and dedication. I want to see India on top of the world. As an IAS officer, I will make efforts for it,” achiever Artika Shukla said. Artika Shukla was born and brought up in Varanasi. She lives in a resident of Gandhinagar, Naria. Her father Dr. Brijesh Shukla is a physician and a former secretary of the IMA. Her mother Lena is a housemaker who played a key role in gaining success. She is youngest among two siblings. Her eldest brother Gaurav Shukla, had cracked UPSC Civil Services in 2012 and got IAS. He is currently posted in Guwahati. Other elder brother Utkarsh Shukla is an officer of Indian Railway Traffic Services (IRTS). 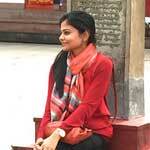 Artika Shukla completed her schooling from St. John School, DLW, Varanasi. She was a throughout topper from this school. After schooling, she cracked Pre Medical Test and went to Maulana Azad Medical College (MAMCH), New Delhi for MBBS and completed in 2013. Dr. Artika Shukla has worked as an intern with Lok Nayak Hospital, Delhi and later joined Postgraduate Institute of Medical Education and Research (PGIMER), Chandigarh as a Junior Intern. Dr. Artika Shukla is currently pursuing doctor of medicine (MD) in Pediatrics from Chandigarh. It was in 2013 when Artika Shukla decided to prepare for UPSC Civil Services. Aritka Shukla quited her MD paediatrics course in November 2014. “When I decided to opt out of the course to prepare for IAS, many people told me that it was a wrong decision and that I should give it a second thought. But, both me and my elder brother Utkarsh Shukla were firm and encouraged me and asked me to go ahead, this is what I wanted and started working hard for it,” Artika Shukla said. Artika Shukla chose Medical Science as her optional subject because she has indepth knowledge of it that helped her a lot in stunning success at UPSC Civil Services Examination, 2015 and has achieved All India Rank 4 in this highly prestigious competitive exam. She calls her brother as her source of inspiration. Artika Shukla also draws inspiration from former President the late Dr. APJ Abdul Kalam. Dr. Artika Shukla is overwhelmed by attaining AIR 4 rank she secured in her very first attempt. “The feeling is yet to sink in. It is almost unbelievable. My phone has not stopped ringing ever since the results were declared and I am just too happy,” Artika Shukla said. It was in 2013 when Artika Shukla decided to prepare for UPSC Civil Services. Artika Shukla said, “At first, I was contemplating how to proceed with it. But, then my brother really helped me with all materials so there was no need to join any coaching for preparations and sought all help and guidance from my brother. I managed to prepare for it while shuttling between Varanasi and Delhi and Chandigarh. Later in August last year, I joined test series for Mains Exams and also did some mock interviews in Delhi for interview preparation.” She has been in the Varanasi since March this year. Artika Shukla happily credited her success to her brother Utsav Shukla who helped her to prepare for UPSC Exam and being her ‘pillar and support’ all throughout. She couldn’t afford to give much time for preparation and was completely relying on the inputs for preparation from her IAS brother. Her brother did lots of help and provided useful tips, including his GS notes. I’m proud of you … u r fabulous ….brilliant…..
congrats mam n i also want to prepare for this exam how i should start from where…. Hi Artika, Congratulations. You are indeed an inspiration to many like me. Would you please be able to share the tips, techniques, approach, materials of this successful attempt? It would be super kind of you, and a great help for me and other aspirants. akshay.girish.naik@gmail.com. Akshay.Naik1@in.ey.com. These are my personal and professional ID’s. Congratulations for your grant success. Welcome and wish you a very prosperous service life… and your dreams will come true that you want to make our India worlds top…. Which book u prepared for ias? Please suggest i would like to prepare myself . Really I’m astonished at ur prodigy. ….super brilliant person. ..congratulations 4 ur eclat..and 4 beginning of New epoch. ..
indeed a proud moment… congo.. ur success to me is jst lyk a tru inspiration. Congratulations you are a true inspiration!!!!!!! 1st of all congratulation 4 ur achivement..maam pls suggest how 2 start…and guide for self study..
Could you please Suggest Material/Books for Preparation. #i Selected Mathematics As Optional,is it Better. I also need to know about this exam…….. would you like to tell me please……..
Congratulations mam…..but i request you continue your medical practices…. in india the shortage of doctor is a bog issue….so if you don’t practice it is totally a waste of medical seats…. because govt give subsidies medical education for making doctor….and again congratulations…. Am in 10, 12,& in college. At first I congratulate you mam! I inspired from u after knowing your amazing success after such type of practices.It is a pleasure time for all INDIAN as we got such talented IAS officer in the form of a leader. I’m a B.Pharm student.I want to be an IAS officer.So please give me some tips by which I will be an IAS officer and will be able to make a change in the corrupt society for which I shall remain greatful to you. Congratulations ARTIKA for being so balanced and focused throughout. Enjoy your success. Being also an Alumini of St.Jhons, DLW really nice to know your achievement. You are really labourious lady. You achieved your goal without coaching. Congratulations ARTIKA for making your dreams come true. Dream on and achieve on. i m in class 12 from pcm. i want to become an IAS Officer. Please give me full guideline. my strong point is maths but physics is little much weak. if i have to do bsc or ba . what optinal subject i have to opt????? Congratulations madam. We needs ur guideline. U achieved it’s without coaching.. Congratulations.. How it’s possible mam? Congratulations Mam, I am very inspired from your article..
success is nothing but the discipline, good manners, talent, and the hard work which was set on fire was everything. congratulations for a sincere and desire achievable lady, congrats Artika mam.